Ex-rental blocks, damaged blocks, or excess concrete barriers - all to purchase at special prices, big savings can be made against list prices, subject to availability. Ideal if you are not worried about the appearance of how they look. 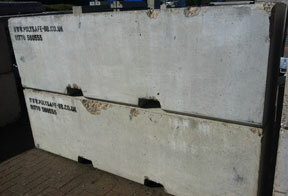 Ex-rental blocks - stock changes daily, please ring for availability. Please remember to add transport to all of the above (see concrete barrier delivery costs) or you can collect with your own suitable vehicle.